Murra (Graece μύρρα < Arabice مر mur), minus recte myrrha et murrha, est resina aromatica quarumlibet specierum parvarum arborum spinosarum generis Commiphorae, praecipue Commiphorae myrrhae. In Evangelio secundum Matthaeum, tres Magi aurum, tus, et murram puero Iesu offerunt. 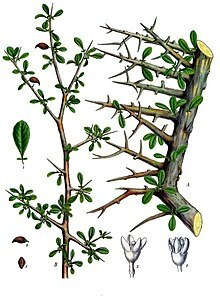 Myrrha est exemplum incensi. Etiam in medicina adhibetur. ↑ Lewis et Short 1879. ↑ Patty C. Rice, Amber: Golden Gem of the Ages (Bloomington: Author House, 2006), 321. Novissima mutatio die 27 Octobris 2014 hora 21:55 facta.